For reservation of accommodation plan, please call from the following or the link below. Reservations for lunch, banquets and other day meals will be made only by phone. Please feel free to inquire about cooking content, fee etc. We are preparing a vast parking lot where you can park as many large-sized buses as you can in the JUKOUEN. We will also correspond to group meals, lunch boxes and so on.Please feel free to inquire about cooking content, fee etc. It is a small inn that we are doing with two couples, please feel free to contact me anything. Telephone reception hours are from 8 AM to 23 PM. It is just a plan Customers who are come to look at HP. 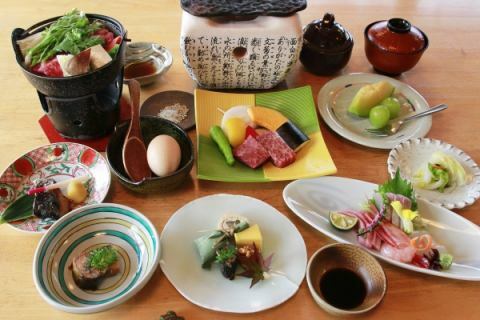 Fukui Prefecture's brand Main dish of Wakasa Beef's pottery grill serves several kinds of seasonal dishes.In addition, 3 kinds of Japanese sake of local Fukui comes with a chief chef selected carefully.It is a plan that you can enjoy Wakasa Beef brand of Fukui Prefecture together with your favorite sake.